As I mentioned in my post earlier in the week, I would expect frost delays the next 3 days which includes Fri-Sun. We were delayed until 8:30 this morning. I think you could expect Saturday's delay to be well past 9 a.m. with the late sunrise and with temperatures falling into the upper 20's. I would check with the pro shop on an approximate start time. They are predicting some wind overnight Friday but I don't think that will save us with the temperatures predicted to be well below 32. We brushed the greens again to work the sand around a little bit more and rolled them. The greens are a little less smooth but we went a couple inches deeper than I normally have been going to give us greater benefit in the long run. Changing the depth every so often will prevent a compaction layer from forming from the aeration program. I'm delaying mowing because we left a little more sand on the surface to protect the crowns of the plants during recovery and help smooth them from play over the last few months. I would expect that we will put a first mow on them after the weekend cold temperatures. Next week appears to be in the 60's & 40's so I would expect the greens to improve considerably over the next 7-10 days and we should be back to regular mowing late next week. As November days continue to pass, we will reduce our mowing schedule and alternate mowing and rolling to begin to allow the turf to slow its growth and harden off toward the end of the month. An increase of height will also accompany this process to improve turf health going into winter. I will apply one more growth regulator that is detrimental to the poa annua and will encourage the bent to grow into the more dominant poa annua areas of turf. Frost is predicted for this weekend around St. Louis so allow me a moment to explain the frost delay policy for our club. Frost is a nuisance this time of year. The last thing we want to do is delay our work schedule so we can be here longer and make our members stand around the pro shop waiting to go out to enjoy their day. The delay occurs because the millions of grass plants can be damaged if stepped or driven upon until the frost has melted. The plants energy is then used to repair the plant instead of being used to strengthen it for winter and next spring. Frost this time of year usually can delay play until 8:30-9 a.m. This includes the practice green as well. The frost this time of year usually only covers the outer leaf of the plant. As temperatures fall well below freezing, plants can freeze completely. Delays can be up to 10-11 a.m. in this case. We open the course once the plant is pliable and cannot be damaged. Not many members come out in the winter during cold days but some do make an attempt to beat the ball around. On some of the colder days, the plants never thaw and the course is kept closed. If you see that temperatures are predicted to be in the 30's in the morning, you can almost be assured there will be a delay unless we have wind or cloud cover which reduces the potential of frost. We will try to give the pro shop an estimate on the delay so they can assist you in planning the start of your round. I will also post it on twitter. If you don't follow me on twitter, you can check on the side of my blog for my twitter feed which will contact course opening announcements. A great video below from the USGA regarding frost and golf. I cannot say it any better! Also, the link for those of you whose email does not show the embedded video. The staff worked about 90 labor hours aerating the greens. Weused our Verti-drain deep-tined aerator with 1/2" solid tines going 9-10" deep with 5% kick. We used about 30 tons of sand on the greens. Our process included the following. Sprayed greens over the last week with fertilizer, root stimulant and water penetrant product. This will encourage healing and reduce dew on greens which dries greens quicker for after aeration mowing/rolling. The greens were mowed and then a granular soil conditioning product was applied. 1000# of Renovate Plus. Topdressing sand was applied heavily to the green. This required almost 2 full loads per green depending upon the size. Our light topdressing during the season usually requires one load of sand per 4-5 greens. The sand layer helps to reduce tracking from the aerator. Greens were then solid tine aerated. The 5% kick occurs when each tine holder is at the bottom of its thrust into the green. This motion will fracture the soil layer that is 4-5" below the surface of the green which improves rooting, oxygen exchange and water penetration. The soil layer is the original surface of the green when they were constructed many eons ago. We then used blowers both backpack and our tow behind blower to help move the sand into the channels. Our brush drag was used as well and it also provided a final smoothed surface. 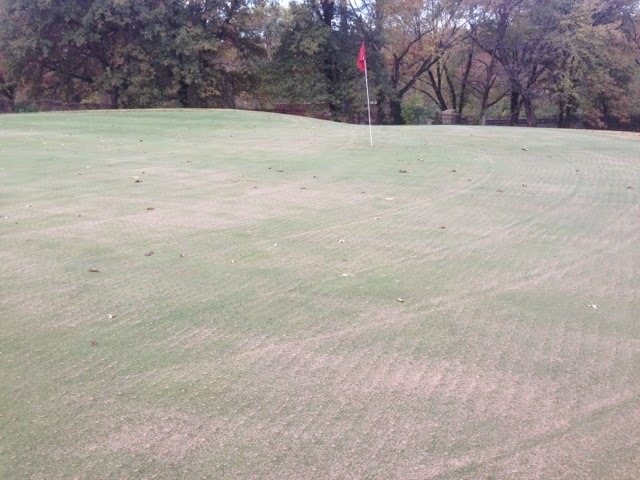 The greens were rolled and holes were changed. To get the guys home last night, we stopped before finishing blowing in the sand on18. It will be completed this morning. Improved root development going into winter and next spring. Gas exchange both oxygen good and too much carbon dioxide(bad). We will do additional brushing later in week where sand is a little mire concentrated to improve ball roll and assist with our first mow. Our first mow will be when it is dry later in week as turf begins to grow through sand. #2 finished, a little sandy but holes filled. That time of year, Deep-tine aeration planned for this Monday, October 26th. In an effort to not disrupt ball roll out in the late summer/early fall, I delay greens aeration until the end of October. Well, that day has arrived. We will begin our greens aeration late Sunday afternoon 5 p.m. and throughout the day on Monday. This process will involve the use of a heavy topdressing of our greens with sand, our Verti-drain deep tine aerator will then poke 9" deep 1/2" holes in our greens, a green profile builder with micronutrient package will be applied, blowing and brushing the sand in the holes and a final roll. We will probably delay mowing greens for a few days to allow the sand to settle and the greens to growth through the sand layer. I would expect to begin dry mowing late next week. Within 10-14 days with the good weather predicted they should be back to normal. We usually are not able to complete all of the greens in one day but will make every effort to complete as many as possible. If we receive rain on Tuesday, we will leave the remaining greens until it is dry enough to complete. Hopefully, this would only be maybe 16-18. I will keep you updated on the blog and twitter on our progress so check out the twitter feed on the side of the blog main page. This will also be the last weekend for practice off of the zoysia short range tee. The zoysia has quit growing and any damage/divots made now will not heal. In an effort to protect it from winter injury and delayed green up next season, we will be placing all stands on the mats beginning next Tuesday. Your cooperation in this matter would be greatly appreciated. The staff have been busy with leaf clean up this week from our Ash, Maple, Cottonwood and other early leaf dropping trees. Two blowers, two rough mowers, 3-4 backpacks have been out regularly cleaning up playing areas. Some days by the end of the day it appears that we have not done anything but that is our life in dealing with excess trees. The real work will begin in a couple weeks when the Oaks begin to drop. This is the last week for two of our seasonal employees Deron and Sam who have done a great job their first year out on the course. Randy will be here the first week of November and will be laid off for the season as well. Nick and Becky will be leaving at the end of November. Great work as well. Becky is busy with installing new plants in our beds for next spring with Pansies, Tulips and installation of new material in the two beds off of the patio area of the clubhouse. Cool season tees, 2,3,10,11,14 were solid tine aerated as were the collars and cool season approaches of our greens. Holes provide new areas for root growth, oxygen exchanged and compaction relief. Also provides water to penetrate and water to evaporate as nececcary for that particular area. We have a nice stack of seasoned oak firewood that was split last winter and is available for sale. $75.00 for a self-service pick up truckload for those of you so inclined. If you have a smaller vehicle I will modify the price accordingly. Home delivery and stacking is available if you prefer for an additional $ 25,00 for those of you who live inside the 270 beltway. An additional $25.00 will be charged for delivery outside of that area and or to the South County. Some deliveries and self-service pick up have already started. We must keep deliveries Mon-Thurs between 9-2 until the end of November since we still have a great deal of course work to accomplish. After Dec 1, we can deliver Mon-Fri between 8-3. No delivery is available during the Christmas/New Year period since staff usually takes vacation during this time. Please contact me either through email jwachter@gecc.org or my cell phone/text (314-575-7321) to set up delivery or to inform me of your self-service pick up. We will bill your account in the usual manner. The staff have spent the last couple weeks using our slit seeder to drill fescue into the rough and cool season green surround areas. Once the seeder went over the area, a metal mat was drug over the area to pull up the grass material that was cut and to place the seed in contact with the ground which improves germination. We purchased 2 tons of seed which is not a great deal if you consider we have about 80 acres of rough but we only seed in close rough areas or worn play areas. Fertilizer has been applied to close rough this week. Some of the fertilizer will be utilized by the existing plants before they begin to shutdown in November. The new seedlings will also use the fertilizer as well. University research as well as our own actual experience has show greater benefit in applying fertilizer before the turf slows drastically. Grass plants are like yours truly, when I eat normally, no extra brownies in the morning or over sized burgers at lunch, my bodies power plant is able to use the nutrition and does not store excess into fat. Plants are only capable of utilizing a certain amount of nutrition. Once they have enough food, it is then turned into storage which is important for the plant strengthening going into winter and for growing out next spring. Once the plant has stored all it can, excess fertilizer is not used and could go to waste Too much fertilizer is a waste of resources and can also contribute to negative effects on the environment. We are finding 30-40% reduction is fertilizer applications still gives us a healthy plant through next spring. The stored energy gives us great green up in the spring and gives us a more steady growth cycle in the spring. The drag that was used to bring up thatch and leaf material that was brought up by the seeder. The right bank behind #17 green with newly emerged seedlings. You can see the lines or slits where the seed was drilled into the soil. The staff did a patch fill in on the Lucas & Hunt wall late last week. 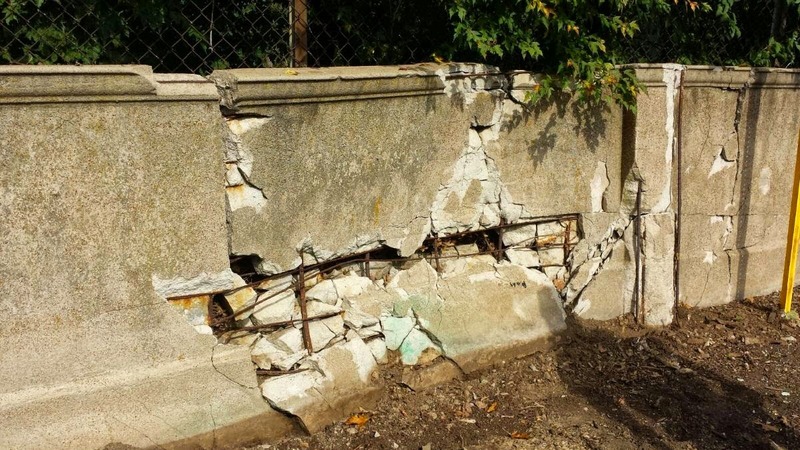 Old wall that was run into many years ago by a car. 30 bags of concrete. Glen Echo. We have a couple of nice ornamental beds that are away from the building but they are to small to have four seasons of interest. We are in the process of expanding the beds over the next few weeks. Becky will be designing it with plants that will flower during the three growing seasons and will also have some architectural interest during the winter. Becky ripped out the existing plants yesterday and has formed a new border. I sprayed with a backpack selective and non-selective weed killer to reduce the competition of the bermuda grass. We will strip out this material next week and will add soil, compost, expand the irrigation and it plants will be installed. She will be adding more plants next spring and of course will have some splash of annuals for color next summer as well. Light not the greatest but bed looked really good this season. Plants removed and new outline with spray marking the area. Very nice planting next to scoreboard but a little small. Expanded border will allow for some structure to be placed in it for off season interest.